Somewhat surprisingly, Lenovo was the first company to formally unveil a Snapdragon 855-powered smartphone last month, but the race might still be on for who can actually release the world’s first handset to use Qualcomm’s state-of-the-art new processor. Xiaomi looks like a pretty strong contender with at least two different devices, both of which have been recently benchmarked running Android 9.0 Pie on the software side of things. If that’s not enough to tell you these bad boys are closing in on their commercial rollouts, it’s worth highlighting that their Geekbench Browser test results are also fairly impressive. That suggests both software and hardware optimizations are nearly finished, unlike on the Galaxy S10 Lite. 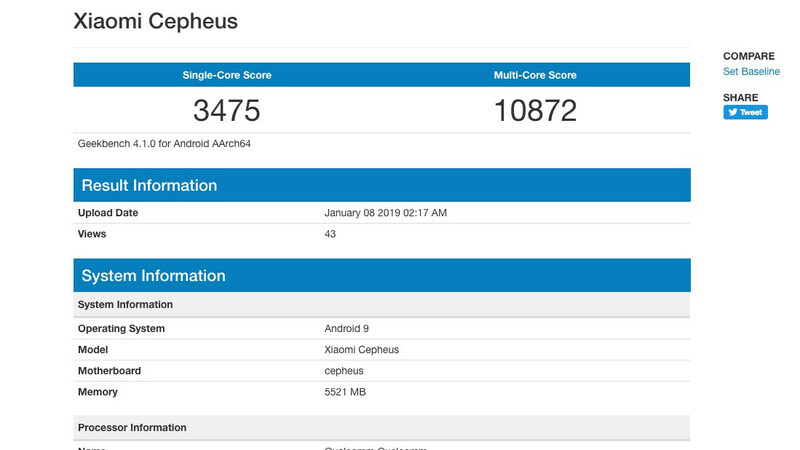 Still, the Xiaomi Cepheus and Blackshark Skywalker fall short of the multi-core records allegedly set by an advanced Sony Xperia XZ4 prototype last week, while posting solid single-core point totals of almost 3500. Obviously, the aforementioned monikers are not the official names of these two phones. Those may seem impossible to predict right now, but the “Blackshark Skywalker” is naturally set to follow in the footsteps of the gaming-centric Black Shark and Black Shark Helo, with the Cepheus codename presumably designating either the special 5G-enabled edition of the Mi Mix 3 or an all-new Xiaomi Mi 9. Cepheus, by the way, is a constellation in the northern sky, which feels like a fitting alias for Xiaomi’s next star performer. Oddly enough, this powerhouse is listed as packing only 6GB RAM in the Geekbench database right now, with the mysterious new Black Shark model upgraded to a full 8 gigs of the good stuff. Of course, both devices are likely to come in multiple memory and storage configurations. Who knows, perhaps one of them will also land in the US with a Snapdragon 855 chipset under the hood.